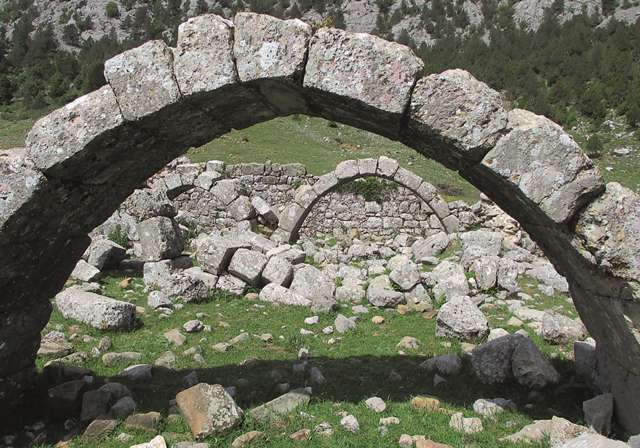 The Eynif Tol Han is located on the Beyşehir-Antalya road, 30 km from the city of Derebucak. This route, in use since the Roman era, was an important route in the time of the Anatolian Seljuks. The han is surrounded by the Taurus Mountains on the east and west. It is located on a slope which faces the Eynif Plain. The previous settlement to the north of the han on this road is the royal complex built by Alaeddin Keykubad at Kubadabad. This road leads south to the Mediterranean Sea, passing by Manavgat and Alanya. This route is especially important, as it was one of the few roads which connected the interior of Anatolia to the Mediterranean Sea. The first han south of Kubadabad is believed to have been the Ebul Hasan Han, located in the village of Bulhasan, but the exact location of this han has not been determined. The following han is the Burma Han, which is mentioned in historical sources, but whose precise location is again not known. Another branch road passes to the east of this road along which are the Ortapayam Tol Han and the Derebucak Tol Han. The route gradually descends through the Taurus Mountains until it reaches the Kargi Han. The han was marked in Kiepert’s maps and the road leading to it was indicated by a thin line. Early researchers and travelers to the region have not mentioned the han. The word “Tol”, which is used by the locals to designate several hans, means “a heap of stones”. This "Tol" han is named after the plain in which it is located. There are two other hans with this same name in the region, but again, their original names are not known. The three hans called “Tol” (“Little Village”) have created considerable confusion in texts. The Eynif Han was not mentioned in any of the journals of voyagers. Only one “Tol” han is mentioned in later sources. The han mentioned by Ozergin and Riefstahl is the Eynif Tol Han. The sketch plan published by Erdmann as belonging to the Eynif Tol Han is actually that of the Ortapayam Han. The information concerning the patron or the construction date of the han is insufficient to make any kind of attribution. Considering the architectural similarities of the Şarapsa, Derebucak Tol and Ortapayam Hans, it can be deduced that they were commissioned by the same unknown patron in the context of the same building program. The inscription plaque of the han was most certainly located above the crown door, but it was not found among the ruins. However, an inscription published in a recent study, which was found in the village of Sirtköy, is stated to belong to the Eynif Tol Han. 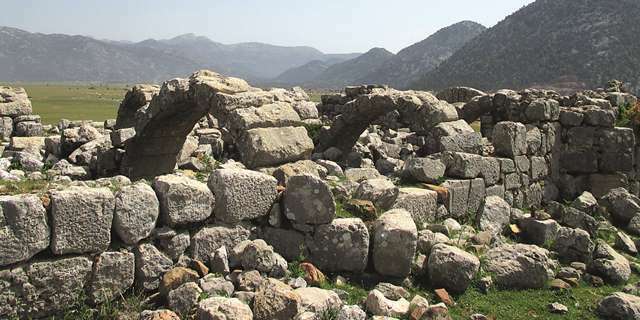 Considering the significant distance between Sirtköy and the Eynif Tol Han, it is highly probable that the inscription belonged to another han near the village. Research has been determined that they are the ruins of another han, not mentioned in any study, but which is called “Tol” by the local villagers. The published inscription must belong to this han, which is located to the east of Sirtköy. The inscription of two lines, which had been moved to the side walls of a house at the entrance of the village, is written in Arabic in Seljuk naskh calligraphy. 2-el-azam Alâüd-dünya ve'd-din ebü'l-feth Keykubâd bin….. There is a second inscription, set in a garden wall 50 m away from the first inscription. It is written in Arabic with naskh style calligraphy. There are differences between the two inscriptions in terms of style and phrasing, and, as such, they may belong to two different buildings erected at the same time. There are differences between the two inscriptions in terms of style and phrasing, and, as such, they may belong to two different buildings erected at the same time. This han belongs to the common group of Anatolian hans with a covered section only, and which comprises five naves. It was most probably originally built with an open courtyard, although no evidence exists to substantiate this claim. The most significant feature of the Eynif Tol Han, which differentiates it from other hans, is that the naves on both sides of the central nave are narrower than the outer naves. From analysis of the ruins of the covered section of the han, it can be determined that the naves covered with pointed vaults. The two outermost naves and the central nave are wide and the two naves in between them are narrow. Four square piers are connected to each other in east-west direction in the support lines. The walls of the han were constructed with the rubble wall technique, in which mortar and small stones were filled in between two pitch-faced stones. Pitch-faced stones were used for the outer walls and for the vaults; whereas smooth-faced stones were used for the arches and the support towers. The craftsmanship is more meticulous in the lower levels of the walls and in the support towers. A few reuse spolia materials were found among the ruins. Three, equally-spaced triangular support towers are located on the south and north sides and two on the east side. In addition, there are towers on both sides of the entrance door on the west side, all of which reach the roof level. Only the regressed arch of the crown door, which projected from the main bearing walls, remains today. Water was provided by a spring located northeast of the han, and can be considered part of the han complex. Traces of water pipes are visible along the west side wall. No traces of a mosque have been uncovered. This is a sturdy work--a-day han, and, as such, it has no decorative elements. The walls of the han are partially ruined. There are vault traces in some sections, but the roof has collapsed. No excavations or renovations have been made of the han. It will only be possible to formulate an idea about the courtyard or the covering of the central nave following a proper excavation of the site. Eravşar, Osman. Yollarin Taniklari (Witnesses of the Way), 2017, pp. 114-118. Erdmann Kurt. Das Anatolische Karavansaray des 13. Jahrhunderts, 1961, p. 97, n. 78. Erten, F. Antalya Vilayet Tarihi. Istanbul, 1940. 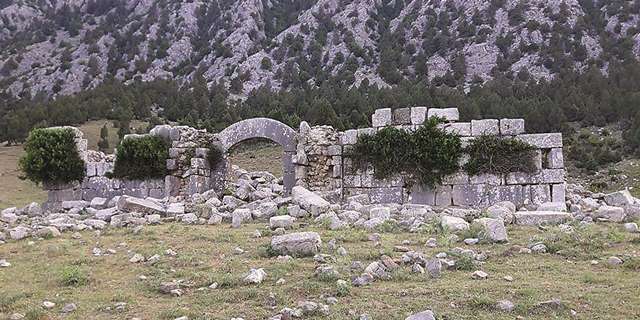 Kunduracı, O. "Kubadabad-Alanya Selçuklu Kervan Yolu Güzergahı Üzerine Yeni Araştırmalar-I”, I. Uluslararası Selçuklu Semineri Bildirileri, Konya, 2001, p. 58. Özergin, M. Kemal. “Anadolu’da Selçuklu Kervansarayları”, Tarih Dergisi, XV/20, 1965, p. 146, 164. Riefstahl, R. Meyer. Turkish Architecture in Southwestern Anatolia, 1931, p. 60.